Nathan Gibbs-Bowling is the Washington State Teacher of the Year for 2016. In the last year, he’s met President Barak Obama; lectured at Harvard and taught Bill Gates about Civil Rights and Star Wars. Nate is a long time Seattle Sounders fan and flew out to Toronto for the recent MLS Cup finals. The freezing cold temperatures, extra time and penalty kicks made for a harrowing fan experience. But he survived, cheered his team on to victory and loved every minute. He believes that his students are the future community members that will live around him and so Nate looks at his teaching as planting seeds for the future. In part, that’s why he calls himself a Nerd Farmer. For many of his students, education and attending college is transformative for their family tree. Nate is very vocal on topics of education, segregation, racial tensions, police brutality both on social media and in his classroom. He’s also used his Teacher of the Year status to continue talking about issues on his heart with an even bigger ‘microphone’. Education isn’t isolated and he sees these topics as directly affecting his students. To follow Nate’s thoughts in real time, follow him on Twitter @nate_bowling. An article from Nate’s blog: www.natebowling.com, entitled The conversation I’m tired of Not Having was picked up by The Huffington Post and went viral. In short, he argues America’s schools are entirely segregated and effectively, people in power are okay with it. As an example, Seattle voted a decade ago for neighborhood schools. Nate argues that neighborhood schools are segregated because housing is segregated. Talking about school segregation led to talk about housing segregation. Talking about housing segregation led Nate to speak with Realtors about past practices of segregation in the housing industry. The practice of redlining literally defined segregated neighborhoods decades ago. 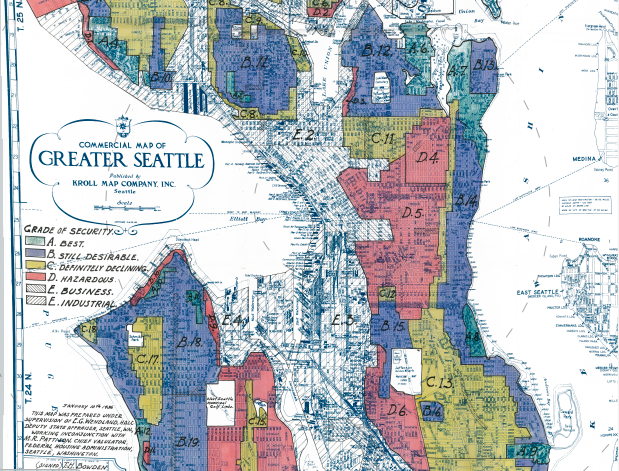 Many of Seattle’s neighborhoods highly populated with people of color were established long ago because of the government-mandated practice of not lending to minorities in certain areas. Put another way, a person of color was not allowed to get a government-backed loan if they wanted to buy a house in an affluent and ‘white’ neighborhood. The most important in-school factor to help students succeed is the quality of the teacher in the classroom. But the most important factor overall is what’s happening at home. If parents are involved and providing a safe environment then students succeed. What determines if a student learns are the following: Food, clothing and effective instruction. Why aren’t the students at the low-income schools excelling? Because their life needs aren’t met. It’s hard to learn about calculus when your stomach is growling. If we made sure our national priority is to feed and clothe every kid, Nate thinks test scores may rise as a result. For the last decade, the state of Washington has not fully funded education. The state has been sued (McCleary, et al. v. State of Washington) and 2017 is the deadline to fully fund education in the state of Washington. Govenor Jay Inslee recently proposed a new budget that increases various revenue streams through taxes. In short, if Inslee’s budget is approved then schools will get more money. Nate would like to see lower income schools receive a bigger slice of the pie but much of those details are up for debate. Increased beginning teaching salaries, teacher mentoring, paid training are just a few of the areas that are a part of the budget. Nate asks professionals as members of organizations who typically take an ‘anti-tax’ stance to be vocal in urging their leaders to consider supporting the tax increases. He thinks we have one last shot to fund education in the state. Nate just shakes his head when asked if he would ever teach in Seattle. One challenge Seattle schools face is the teachers at the poorest schools can’t retain their teachers in the same way wealthier schools do. He compares Rainier Beach and Roosevelt High School. Typically, more tenured teachers are more skilled yet the poorest schools often get the greenest teachers.